An example of flared feet with many hoof wall cracks. The rasp marks and attempts to stop the cracks are ineffective because they do not address the cause of the cracks which is the flared foot. Until the flare is removed the feet will continue to crack. This flared foot has mud packed into the white line and significant separation has occurred. The cracks you can see were the tip of the iceberg for this horse. A draught horse with good hoof quality but long flared toes which have led to a single crack. Frequently removing the flare and relieving pressure from the base of the crack will restore this foot to normal over time. Small surface cracks are usually seen in the first 1 – 2 mm of hoof wall, running from coronary band to ground surface. They may begin at the top or the ground surface, but often begin just below the coronary band and grow downward with the wall. These cracks don’t do any serious harm; they are caused by a combination of genetic, dietary and environmental factors. When diet and environment are improved they usually grow out, but some horses have genetically poor quality hooves in both conformation and structure, requiring a high quality diet and regular farriery care to prevent them developing weak, flaking or cracked hooves. A BALANCED DIET INCLUDES THE NECESSARY VITAMINS, MINERALS, AMINOACIDS, FATTY ACIDS AND ELEMENTS WHICH COMBINE TO PRODUCE STRONG, HEALTHY KERATIN (A PROTEIN) OF WHICH THE HOOF WALL AND SOLE ARE FORMED. FEEDING A TOTALLY BALANCED DIET IS BETTER THAN SUPPLEMENTING ONE MINERAL OR AMINO-ACID. OVER FEEDING SUPPLEMENTS DOES NOT INCREASE RESULTS AS THEY ARE ONLY OF BENEFIT IF THERE IS A DIETARY DEFICIENCY. A most important concept of the horse’s foot and farriery is that the hoof wall grows as a cone. The cone is smallest at the coronary band and larger at the ground surface. Therefore, the foot has a larger radius the further it is from the coronary band. This is why hooves grow over the shoes, despite the fact that they fitted when they were put on. Six weeks later, the hoof surface area at the ground is larger than it was when the shoes were fitted. The tiny tubules that make up the hoof wall are the same size at the top as they are at the ground surface. Therefore, as they are basically lifeless tissue, they are unable to heal and are most easily pulled apart sideways close to the ground surface. The longer the foot is beyond its maximum length for soundness and hoof balance, the more force is tearing the horn tubules apart. To demonstrate this concept take a handful of straws and keep them in your fist all lined up closely and with no spaces between them. Now stand them on a flat surface still bunched closely together and you will notice while holding them that you can place weight on them with your free hand and they will maintain their direction and strength as long as they are bound closely together in alignment. Now let them flare at the base so that they are a ‘teepee’ shape. As you place weight upon them, they will flare outward and easily collapse downward as the straws become further and further apart, and the area on the table top they cover becomes bigger and bigger. 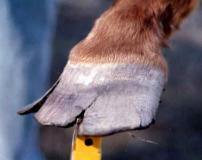 This is the concept of a flared hoof with hoof cracks ascending from the ground surface towards the coronary band. 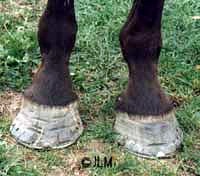 Flares are the main cause of hoof cracks, and are usually due to lack of regular farriery care. Most horses have some conformation faults, and it is the conformation of the distal limb and foot that determines where the flare will be. Flares usually form on the inside toe for toe-in, and the outside toe for toe-out. Flares lead to imbalanced weight-bearing of the wall that exaggerates the flare and leads to hoof cracks. As the wall becomes warped, the horn tubules separate at the weakest point (ground surface). As the wall has no ability to repair itself, the crack is forced apart with each step, traveling upward towards the coronary band. Mud, packed into the crack, is forced upward with each stride. This can result in pressure, infection and seedy toe. Over time, a flare usually develops an inward dish in the wall above it. Dishes and flares are usually seen on the same foot. The inward pressure is a result of the outward flare at the base and can result in permanent changes to the shape of the pedal bone. This makes it difficult – if not impossible to regain a normal pattern of hoof growth without flares if the feet are allowed to get too long or are neglected. After all, it was conformation of the foot that predisposed it to developing the flare in the first place. 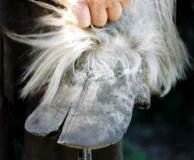 Flares occur on foal feet, so start your hoof maintenance early. The best way to manage dishes and flares is to remove the flare from the outside of the hoof with a rasp and then dress the ground surface. This should be done at regular intervals, 2 – 4 weekly for foals, and 4 – 6 weekly for most adults. Some farriers advise unloading the flared wall and making the area non weight-bearing. I have found this is not always possible or practical even for shod feet. You may find that after you have removed the flared wall from a foot there is only a little heel left to remove, and a bevelled edge will finish the trim. Do not shorten the foot from underneath until after the flares have been removed from the front, otherwise you risk over-shortening the hoof and making the horse uncomfortable.